Trump held a rally outside the firehouse that had the feel of a campaign stump speech, waving the Texas Lone Star flag, describing the storm as “epic,” and insuring the crowd that Texas would persevere. The floodwaters not only displace people, but pose significant risks to health and safety. They can be full of contaminants. 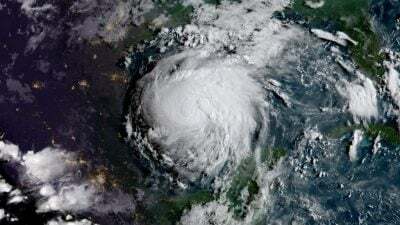 “Flood water mixes with everything below it,” Dr. Richard Bradley, chief of the division of emergency medical services at McGovern Medical School at the University of Texas Science Center at Houston, told Time magazine. Featured image is from Grist.